We've come to an everything moment in the year. 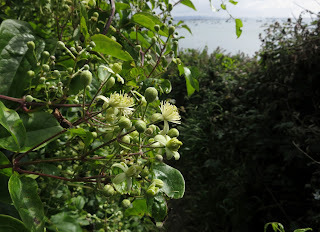 Flowers and berries and seeds all mixed up in the hedgerows. Always, always, I like to see Alexander seeds; their black glossyness, their shapes. Blackberry flowers are pretty. More important (to me!) - their fruits are forming. Buds, flowers, fruits all on the same plant, all there in the fuzzy background. Down the path, towards the sea. Stop. Let's stand still. 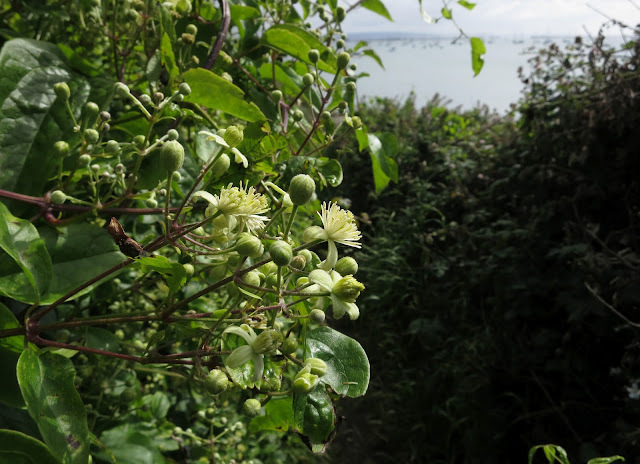 Wild Clematis - Traveler's Joy - Old Man's Bear - the same plant. It produces flowers - small, pretty, about half an inch across. The seed heads will be massive and hairy - beards! 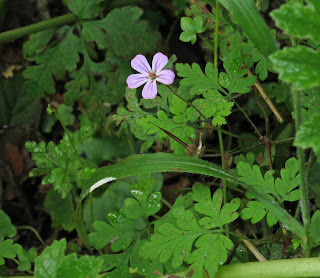 And under the blackberry bushes - Herb Robert. Something was striking me. No butterflies. Lots of buddleia but no butterflies. I walked down towards the sea and, just as the path opened out - black butterflies. I've not seen black butterflies before. I chased them around, camera in hand. It was sunny. Surely, one would stop in the sun and spread its wings. Isn't that what butterflies do? I trampled the grass. Had my way stopped by reeds. The butterflies stayed in the air, alighting for fractions of seconds - then off again. Then I saw a white butterfly with black dots - a sort of marble effect. That wouldn't stop still either. None on the buddleia. New (to me) ones in the open. Odd year! it has been a strange year and I am sure the wildlife is as confused as we are! I wonder if the white butterfly was a Marbled White? I've just returned from a fortnight in Dorset! Definitely not as many butterflies as in previous, although hopefully they may pick up now that the weather is improving.. The dark brown/black butterfly may have been a ringlet? Very strange year indeed! So sad for the insects. I saw lots of Bumble Bees and Butterflies back in May when it was lovely and sunny.Since then an occasional sighting of single Butterflies and an occasional Bumble Bee in the polytunnel. Never seen a black butterfly in Britain - woo! 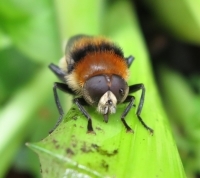 Heavy rain can't be good for flying insects. I have seen very few butterflies in the garden this year and I have a Buddleia. We are going to have a ton of blackberries this year. Yumm! Hi Sharon - one can never eat one's full of blackberries! It's always a disappointment when the season ends however many pies there have been since its beginning. Hi Toffeeapple. Thanks for the suggestion about the Marbled White. I think you are right. Hi Plantchaser. The alexanders grow wild and drop their own seed. Hello Kitty. There were certainly Ringlets but there were a couple of larger black butterflies too. Maybe they were simply large ringlets! I don't know but I'll keep my eyes out for them again. Hi Bridget. I too saw lots of bees earlier in the year - though I don't think I noticed many butterflies even then. It's their absence on the buddleia that's so striking at present. Hi Easy Gardener. I have a photograph of a very ragged Ringlet butterfly. 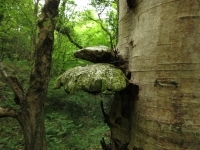 I imagine it had been battered by wind and rain when I met it. Hello Jennifer. I agree. Lots of blackberries warrants a 'Yay! '.